Sugar consumption has more than tripled worldwide in the past 50 years, contributing to an elevated burden of non-communicable diseases (NCDs) such as obesity, type 2 diabetes and certain forms of cancer. Mexico has been at the forefront of the obesity epidemic and borne the crippling burden of sugar related chronic NCDs. It has also been a leader in implementing public health policy to regulate the addition and consumption of sugar, with consumer groups like El Poder Del Consumidor and artists like Cacto Productions taking a leading role in advocating change. With the forthcoming introduction of the sugar tax in the UK, the Public Health Film Society and the University of Oxford Nuffield Department of Population Health are pleased to screen for the first time in the UK, the new film ‘Sweet Agony’ by Cacto Productions together with ‘Jamie Olivier’s Sugar Rush’. This will be followed by a discussion with the film producers, campaigners from Jamie Oliver’s Foundation and public health academics from the University of Oxford. 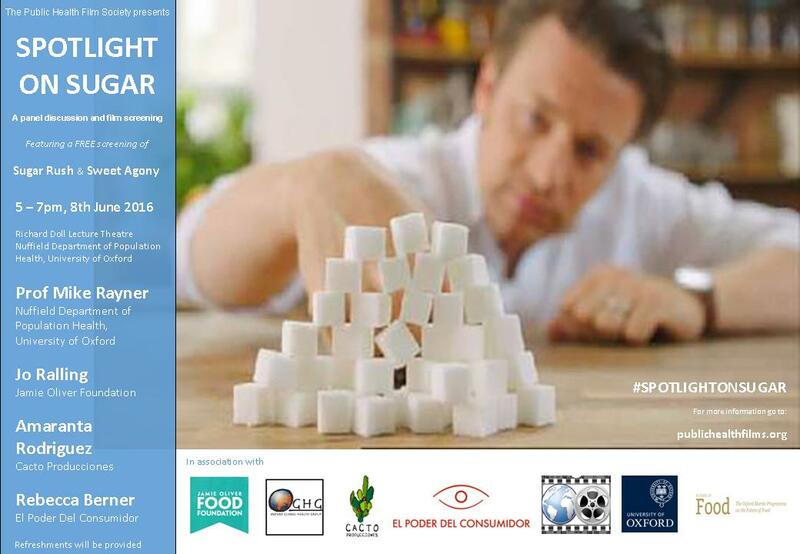 Our ‘Spotlight on Sugar’ is on 8th June 2016 in the Richard Doll Lecture Theatre from 5 to 7pm. Drinks reception from 5pm in the Atrium, Richard Doll Building.